Hand writing is an integral part of learning and while achieving the correct pattern it will be a fun filled task for the child to engage with. This program is specially designed for cerebral palsy and autistic kids and it uses multi sensory approach and strategies. The program follows research that demonstrates children learn more effectively by actively doing, with materials that address all styles of learning. Hand writing is not simply a task for hands only, as it requires a perfect assimilation of visual motor skills, visual perceptual skills, fine motor skills, trunk control and shoulder stability. Visual motor skills: i.e. a child’s ability to copy shapes, letters or numbers. Simply it means using vision to guide written output. 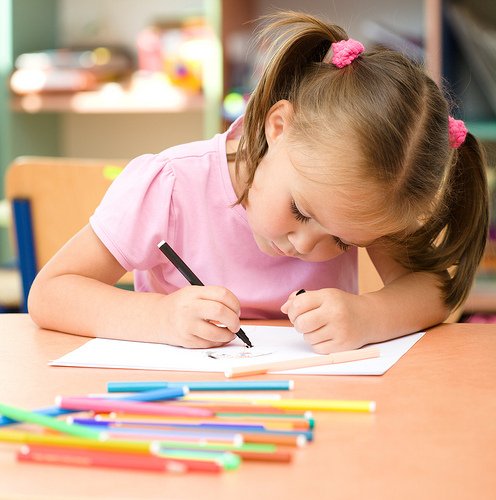 Basic visual motor skills for the preschooler entail drawing a line to join objects. More advanced examples of this skill involve copying cursive letters accurately. Visual perceptual skills: describe a child’s ability to use visual information to make meaning of what he sees. When learning letters a child must be able to recognize letters, recall what a letter looks like and discriminate between two familiar letters such as “b” and “p”. Fine Motor Skills: Difficulty with fine motor skill causes a child to have difficulty with fasteners such as buttons or snaps, poor pencil grip (often holding a pencil in a fisted grip) and an inability to work manipulative such as stringing beads. Development of a transverse arch from the thumb side to the pinky side of the hand, giving a curved look to the back of the hand. An “open web space” between the thumb and forefinger is noted when holding objects in the hand. Separation of the two sides of the hand evolves, with the thumb side of the hand developing refined dexterity skills while the pinky side of the hand offers strength and stability. Trunk Control: A strong and steady trunk provides the base of support needed for delicate fine motor tasks like writing. Houlder Stability A child has problems with shoulder stability if he cannot hold himself in a hands and knees position or locks the elbow joint in this position. He may brace his arm against his side when engaged in a fine motor activity. Many muscles around the shoulder work together to hold this joint stable. When writing, we use very slow, well controlled shoulder movements. If a child has poor shoulder stability, then he cannot hold this joint stable. If this joint is loose, then fine motor control needed for writing is impossible to achieve. Clearly, writing skills suffer.